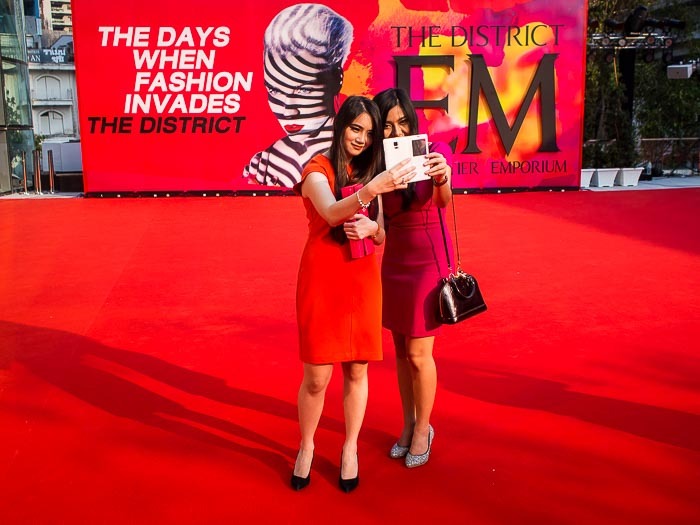 Women take "selfies" of each other on the red carpet in front of EmQuartier, the newest shopping mall in Bangkok. Central Bangkok, an area rich with upscale shopping malls, has another place where the 1% can spend their hard earned Baht. EmQuartier (note: it is not "EmQuarter") is a new shopping destination across Sukhumvit Road from Emporium, a well known high end mall in Bangkok. 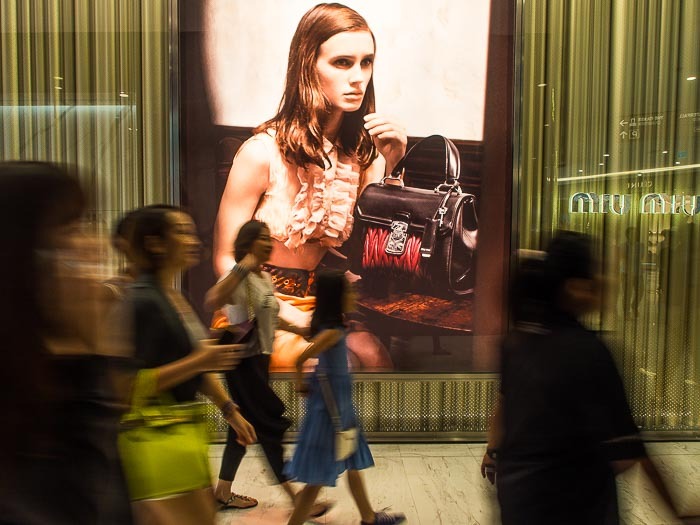 Shoppers walk past a women's fashion store in EmQuartier. 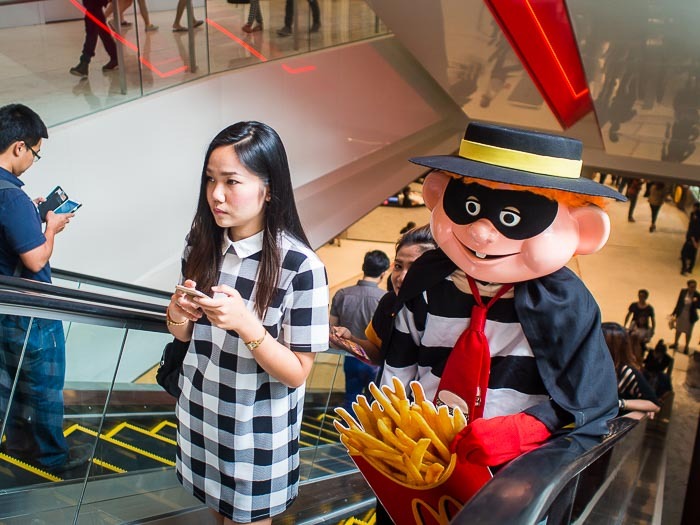 The EM District is owned by the same developers who own Paragon, another large, very high end, shopping complex on Rama I Road, about 4.5 kilometers (roughly 2.5 miles) from Emporium and the EM District. Paragon is on Rama I, but both are really the same road. Rama I changes names several times but it is a straight shot down Sukhumvit to Rama I and Paragon is a longish walk from EM District. 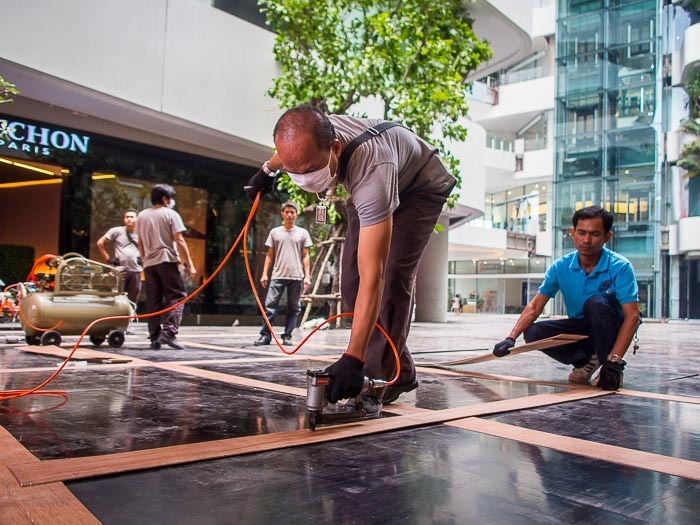 A worker installs flooring in a courtyard at the new mall. There's a plethora of expensive malls between Paragon and EM District. Coming out Rama I/Phloen Chit/Sukhumvit (the three run together) there is: Paragon, a "luxury" mall; Siam Square, which features fashions geared to college students and young adults; CentralWorld, a sprawling mall with almost every high end western and Japanese chain store you can name; Gaysorn, one of the first high end malls in Bangkok; Central Chidlom (also spelled Chit Lom), more of a huge department store with aspirations of being a mall; Central Embassy, a brand new mall that opened in 2014 and still seems mostly empty and Terminal 21, a mall popular with Thai teenagers and fashionistas. Of all the malls, only Terminal 21 has a really unique identity and is geared to local people. 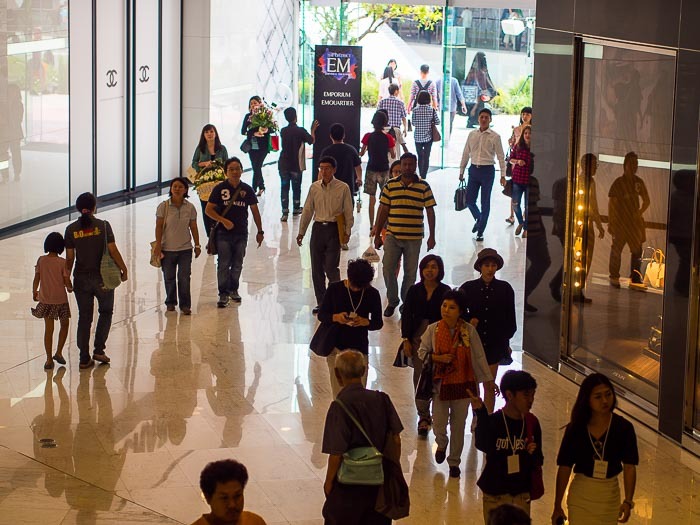 EmQuartier is opening in the midst of what seems to be an economic slow down in Thailand. There are near daily reports in the local media about economic challenges facing Thailand. Thailand's export driven economy is facing hurdles as the export driven economies of Indonesia, the Philippines and Vietnam gather strength. Tourism in Thailand is experiencing a slowdown because Russians (who make up a big part of the tourism to Thailand) can't afford to travel as the ruble collapses. People file into EmQuartier a few hours after it opened. As a lay person observer and resident of Bangkok, this development does not feel sustainable. One of the problems is that the malls (again, except for Terminal 21) all have the same stores and restaurants. Paragon is unique because you can buy a car in the mall (so long as you're buying a Rolls Royce or Masareti. Seriously, there are Rolls and Maserati showrooms in Paragon) but otherwise they feel very similar. 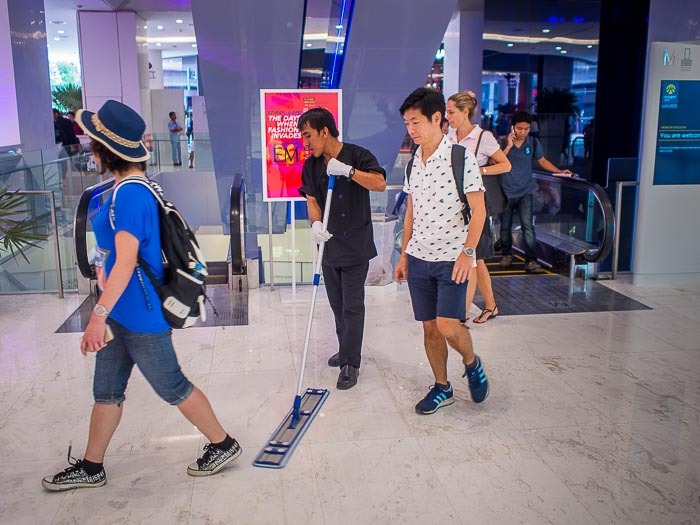 A worker dry mops a floor while shoppers go around him. 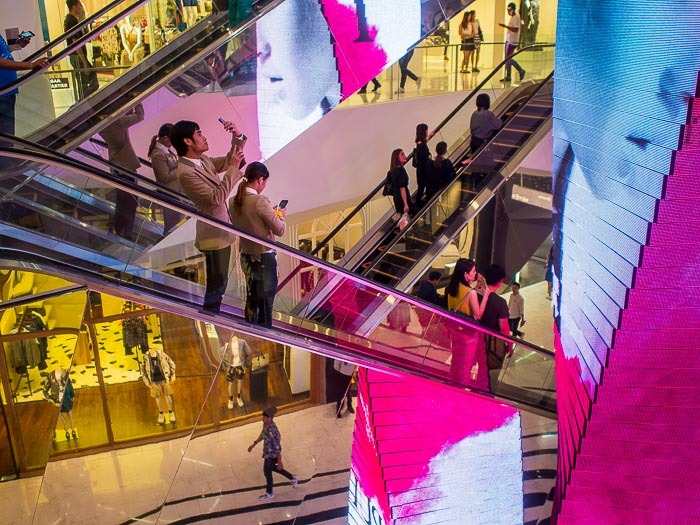 All of these malls contribute to the surreal nature of living in Bangkok. I can go from photographing in Khlong Toey market or slum to eating at an expensive bistro in EmQuartier in minutes. It's about 2.5 kilometers (roughly two miles) from one of Bangkok's most famous wet markets and infamous slums to some of the most expensive retail in Southeast Asia. This really is an amazing city.